Robert McCrum at the British newspaper the Guardian offers a piece on British spy and traitor Guy Burgess and his meetings with a British newspaperman. Ever since two members of the Foreign Office, Guy Burgess and Donald Maclean, both Cambridge graduates, screeched their Austin saloon to a halt in Southampton docks and scrambled aboard the midnight ferry to Saint-Malo in the closing minutes of 25 May 1951, their dramatic flight has sponsored a minor genre. Now, with the release by MI5 of secret documents dealing with the Burgess and Maclean scandal, there is a new perspective on the betrayal that enthralled a generation. Two biographies of Burgess and a forthcoming account of Maclean (Orphan: The Lives of Donald Maclean by Roland Philipps) are just the latest manifestations of 1950s spy-mania. From thrillers and biographies to Alan Bennett’s television drama An Englishman Abroad, the “missing diplomats” (it was several weeks before their treachery as Soviet spies was confirmed) have inspired thousands of column inches. The awesome scale of Russian penetration became a national obsession. In government, there was disbelief; among the reading public, fascination. Throughout the 1950s, the top newspaper story from Moscow was less to do with Stalin or Khrushchev than Burgess and Maclean, who became a strange kind of national brand as familiar to British readers as Fortnum & Mason or Gilbert and Sullivan. For the defectors, their new life in the Soviet Union was both Yeomen of the Guardand Pirates of Penzance. Burgess was as worldly, reckless and compelling as his co-conspirator was stiff, ideological and forbidding. Where Maclean made a new career as “Mark Frazer”, instructing Soviet diplomats and avoiding British journalists, Burgess remained himself, a charming and erratic high-living homosexual, who continued to cruise and booze with Rabelaisian joie de vivre. 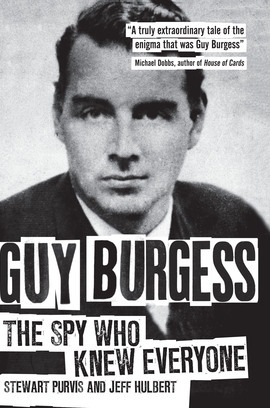 The sensational irruption of Guy Burgess, either on the telephone or in person, became a bizarre rite of passage for the English visitor to Soviet Moscow. On his first meeting with Michael Redgrave, who was playing in Hamlet with a touring Shakespeare company, Burgess was so drunk he threw up in the star’s dressing room, a story that would eventually attract Bennett’s attention. Not everyone was enchanted by Burgess: Edward Crankshaw, for instance, was typical of the 1950s Observer. Like David Astor, his editor, he had done secret work in the second world war, serving in Moscow and then at Bletchley Park. Astor, who often hired journalists with wartime intelligence connections, brought Crankshaw on to his staff in 1947 to specialise in Soviet Russia. As an Observer recruit, Crankshaw had even been summoned by Burgess, in his Foreign Office guise, for a dressing-down for being “too soft towards Russia”. It was Crankshaw’s first meeting with Burgess and he was not impressed. But he was no ordinary journalist. Steeped in Russia, Crankshaw seems always to have mixed reportage with espionage, attracting the attention of both the CIA and the KGB.